Meet the Doobert Transport of the Week, Lucy! Lucy is a fun, Pit Bull Terrier dog that loves to play! 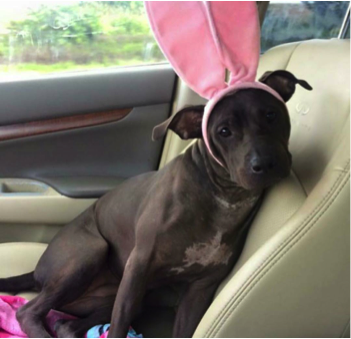 Lucy was found in an animal shelter in Florida, where she was abandoned and neglected. When she was just a puppy, Lucy was found by Mayte Garcia of Mayte’s Rescue. Pit Bull Terrier dogs are family friendly and a true companion. They are affectionate towards kids and family members and are fairly easy to train. Pit Bull Terrier dogs are quite intelligent, love exercise and are highly playful! As she has grown up, Lucy has been fostered with seven other dogs including a Maltese, a Yorkie and another Pit Bull. While being a foster dog, Lucy went to school and learned how to play and get along with other dogs, receiving all the dog social ropes she needs in the real world. One of the seven dogs Lucy was fostered with will be traveling with her! Another Pit Bull Terrier dog, Rose, will be Lucy’s sister! Both dogs have a ton of love to give between them and cannot wait to meet their new family. Pawsitively Famous, Inc. R.A.C.E, will be transporting Lucy and Rose from Fort Lauderdale, Florida to their new home in Annandale, Virginia. They will be adventuring on a 1,020-mile journey to their forever home! Lucy wanted to make sure everyone knows that she has a sweet tooth for apples, especially her new family! Thank you to the Mayte’s Rescue for finding Lucy and the Transportation Coordinator, Jessica Mueller and her organization, Pawsitively Famous, Inc. R.A.C.E, for transporting Lucy to her new home! Learn more about Pawsitively Famous, Inc. R.A.C.E here, www.race4ran.com.